Rick Braun is known for making his trumpet do the singing. Although he has used his voice, like he did with the popular “Love Will Find a Way” from Body and Soul, he has never made it the focal point of a recording. That changes with Sings With Strings (Artistry Music, 2011). 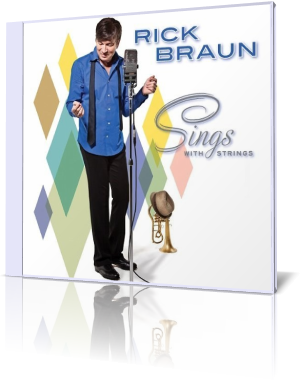 Braun has chosen for this set 11 vocal ballads – several well-known standards as well as a few obscure titles. In addition to singing, he plays flugelhorn. Accompanying him are Joe Labarbera on drums, David Finck on acoustic bass, Dean Parks on guitar, and producer/arranger Phillippe Saisse on acoustic piano, vibes and percussion. The strings are provided by Orchestra.net. “I Didn’t Know What Time It Was,” “I Thought About You” and “The Things We Did Last Summer” are throwbacks to a time when crooners like Frank Sinatra, Chet Baker and Sammy Davis Jr. were kings. Braun’s voice is a smooth, mid-range tenor. He doesn’t merely call the notes, but guides them with joy and passion, going from subtle to dynamic at the appropriate times. French singer Jasmine Roy performs a duet with Braun on “Plus Je T’Embrasse,” aided by a Johan Renard violin solo. Sings With Strings is a pleasant change of pace from Braun’s instrumental efforts. His use of the flugelhorn instead of the trumpet adds to the romantic atmosphere, as the instrument is softer.